With the perfect combination of the right ingredients, you can make the best pick-me-up smoothie, for those days when you really need it most. The 3 smoothie recipes below will definitely give you natural boost of those happy hormones. Blend all ingredients together until totally smooth. 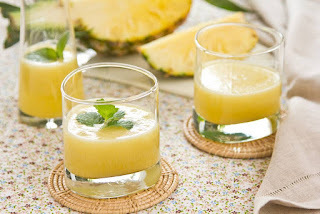 This healthy pineapple treat is full of vitamin B, that helps reduce anxiety and lift mood. It is also contains a mood-brightening vitamin C to help reduce the stress hormone cortisol..